Senior guard Terriell Bradley ranks No. 7 in scoring in program history after two and a half seasons with the Mean Green and is about to complete her redshirt season. Bradley started her career in the Big 12 at Kansas. During this time, North Texas women’s basketball head coach Jalie Mitchell was an assistant for conference rival Texas. Mitchell recalls Bradley standing out to her in the two teams first meeting. In Bradley’s first year with the Jayhawks, she averaged 11 minutes per game and 6.4 points per game. Following the 2014-15 season, the New Orleans native transferred to North Texas and sat out the 2015-16 season by NCAA transfer regulations. In Bradley’s first season with North Texas, she averaged 12.8 points per game, which led the team on 28.7 minutes per game. In the 2017-18 season, Bradley was recognized to first-team All-Conference USA, finishing the season out with 578 points — the third most in a single season in school history and the most in 32 seasons. 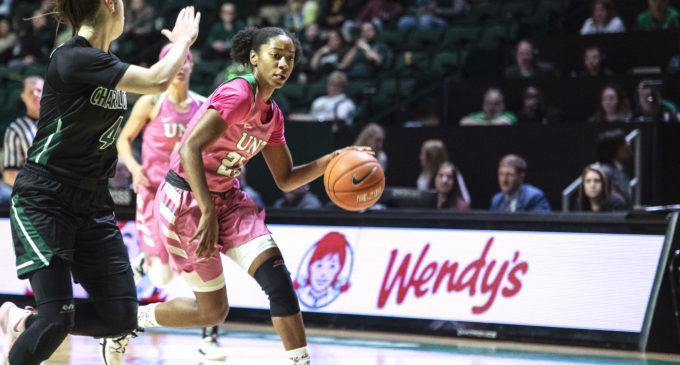 Bradley is now in her final season of college basketball with the Mean Green and is finding her way into the record books, averaging 17.6 points per game in 33.5 minutes per game on a 38 percent shooting clip and 37.4 percent from the arc. Bradley leads the team in three-point attempts (91) by 24 and is shooting the highest 3-point percentage on the team, despite having already missed two games this season due to a leg injury. “Scoring is something my team needs from me on a nightly basis, so that’s what I try and do.” Bradley said. Bradley is now back and healthy and will look to lead the Mean Green, who are currently right in the middle of the pack of Conference USA (11-10, 4-5 C-USA) with 7 games left in the season. With 1,292 career points, Bradley is currently 67 points behind No. 6 in scoring and needs 102 points to break the top-five list, led by Mitchell. Bradley led the team in threes last season with 52, tying for No. 9 in program history. She is currently on track to knock in 47 this season, setting her up to break more records this season. Assistant coach Kasondra Foreman said that Bradley is known throughout the state of Texas as an excellent shooter. Bradley hit nine three-pointers in ten attempts in one game last season, which now currently holds the record for the most by a player in program history. In order to reach No. 1 on career scoring and surpass her head coach, Bradley would have to score 372 points in seven regular season games and the post-season. Featured Image: Mean Green senior guard Terriell Bradley drives against a Charlotte defender at the Super Pit on Saturday, Feb. 3, 2019. . Image by: Trevon McWilliams.